Our recruitment services are considered to be the best among the others in the market. Owing to the extensive databank of the best resumes for each job profile, we are considered to be the reliable source whenever there is the need for candidates for any vacancy. There is a rapid increase in the demand for professionals in industries like engineering, petrochemical, health care, IT, hospitality, real estate, banking and finance, electrical engineering, civil construction and outsourcing industries and many more. We follow a unique methodology in selecting the best candidates for each job profile. This comprises of stages which begin right from the discussion with the clients regarding their specific requisites for the candidate to the accomplishment of legal documentation procedures. We test the candidates on the basis of their aptitude and skill. At the same time, proper care is taken to check if the candidate is medically fit for the job profile. Their medical diagnosis is done at authorized centers. 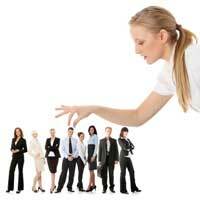 We have carved a niche for our self in the market with our impeccable recruitment services. We have garnered a huge clientele across the globe with our services. Many of our candidates have been placed in big as well as medium scale industries as executives, office staff and data entry operators and many more.